Born and raised in Fort Collins, Todd is proud to call himself a true Coloradoan. He is thankful for such a beautiful place to live with some of the nicest people one can find. For almost 15 years, Todd has worked in the hard wood floor industry to provide his customers with the best in quality and in service. He considers it a privilege to help his customers make their house a home and truly enjoys going to work every day. 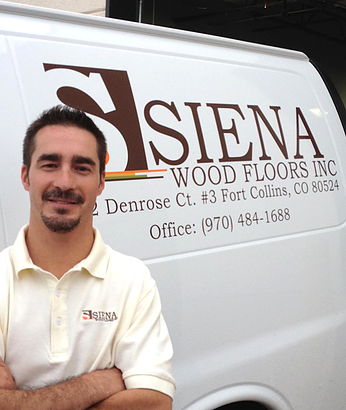 As a small business owner, he values his colleagues and suppliers and knows that for a job to go well, Siena Wood Floors must lead the way in team work and in diligence. When Todd has a chance to get away from the daily work of Siena, he is spending time with his family and friends. Todd and his wife, Kelly, enjoy traveling, finding great restaurants and being outdoors. In addition to being a man who plays golf and goes hunting each fall, he is also known by many for his love of cooking homemade Italian food.